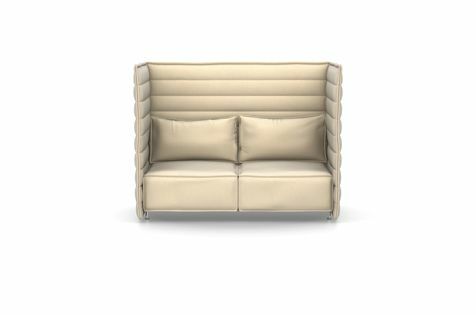 The Alcove Plume Contract Highback sofa by Ronan and Erwan Bouroullec appears almost like a minimalist sculpture, while its high back and side panels create an inviting, secluded niche. The cubic architectural element not only brings structure to interior spaces, but also offers soft comfort and sheltered privacy in open-plan office environments and public settings. Powder-coated steel, no external tubular frame. Tubular steel, chrome-plated or powder-coated (smooth).